Desiring God is a book devoted to helping readers find their happiness in God. The theme is that “God is most glorified in me when I am most satisfied in him.” Dr. Piper carefully builds his case for this concept and calls it Christian hedonism. The issue for the Christian is one of desire. Will one feast on the pleasures of sin or will he run to the streams that God offers and drink from his delights. Christian hedonism is really a philosophy of life that is driven by five convictions. 1) The longing to be happy is a universal experience, and it is good, not sinful. 2) We should never try to deny or resist our longing to be happy. Rather we should seek to intensify this longing and nourish it with whatever will provide the deepest and most enduring satisfaction. 3) The deepest and most enduring happiness is found in God alone. 4) The happiness we find in God reaches its consummation when it is shared with others in love. 5) To the extent we try to abandon the pursuit of our own pleasure, we fail to honor God and love people. Or, to put it positively: the pursuit of pleasure is a necessary part of all worship and virtue. In other words, the chief end of man is to glorify God by enjoying Him forever. Piper develops the concept of Christian hedonism by applying the principles to the subjects of conversion, worship, love, Scripture, prayer, money, marriage, missions and suffering (Suffering has been added to the tenth anniversary edition of the book). Desiring God is filled to the rim with strengths. The writing is clear and thought-provoking. The content is not abstract and unrelated to life. Rather it hits the reader right between the eyes with the truth of God. Second, the writer comes to the table with a Reformed worldview which pervades the book [I might add that the writer rejects the Reformed emphasis on the Covenant of works]. Third, this book forces the reader to deal with matters of the heart. Forth, this book is radically God-centered. Every subject discussed comes back to the issue of the Lordship of Jesus and whether or not the reader is finding his complete satisfaction in Him. Piper has written a tremendous book. He has the heart of a pastor and the mind of a theologian, a combination difficult to find in twenty-first century pastors. 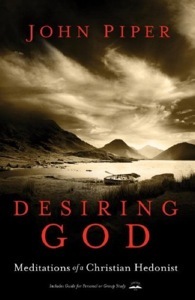 Desiring God is a passionate book. The contents will not only bring the reader to tears, but will engage his thinking in ways beyond the scope of his imagination. Desiring God is a practical book. It challenges readers to re-examine cherished presuppositions and think biblically about crucial life issues. – One of the most important books written in the last 100 years!